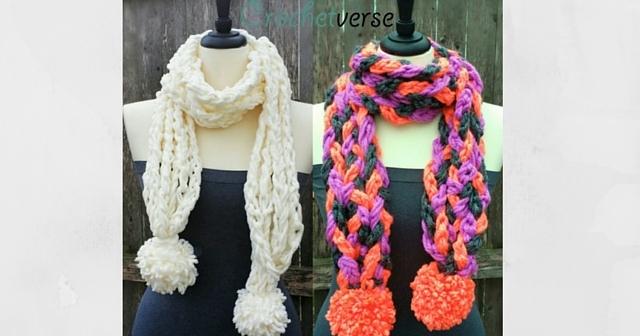 A Twofer Scarf Pattern & Learn Finger Crochet! Today, we’ve got a TWOFER for you! One pattern, Two options, No hooks! YES, I said NO hook! Nada, Zero, Zilch 🙂 Read on! What’s your style…. Long & Ropin’ or Wild & Woven? 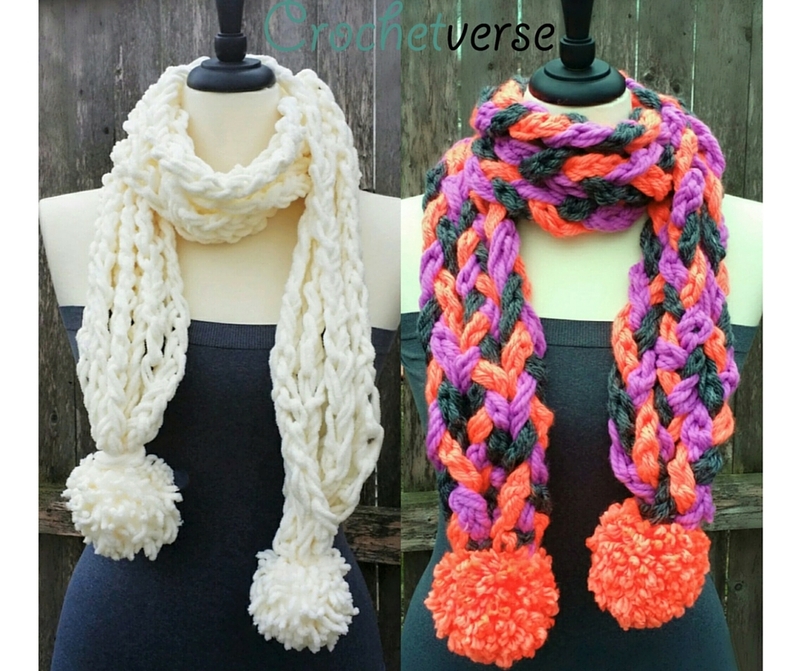 Either way, in under an hour and with no hooks, you will be struttin’ your stuff in no time sporting one of these scarves! You need nothing but some yarn and your hands (actually just 2 fingers! ), we are going to learn to FINGER CROCHET! 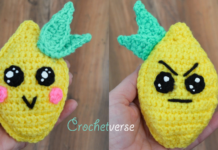 It’s as easy as it sounds, we are going to crochet with our fingers, NO HOOK. FUHGETABOUDIT if your hook falls in the couch, we don’t need no stinkin’ hook for this. You’ll be off an running in just three steps: *Note, I will be making use of my 2 years of Spanish here in my numbering, seeing as I don’t get the chance too often 😉 You can practice with any yarn you like, for this part. The actual pattern begins below, once you’ve learned the technique. 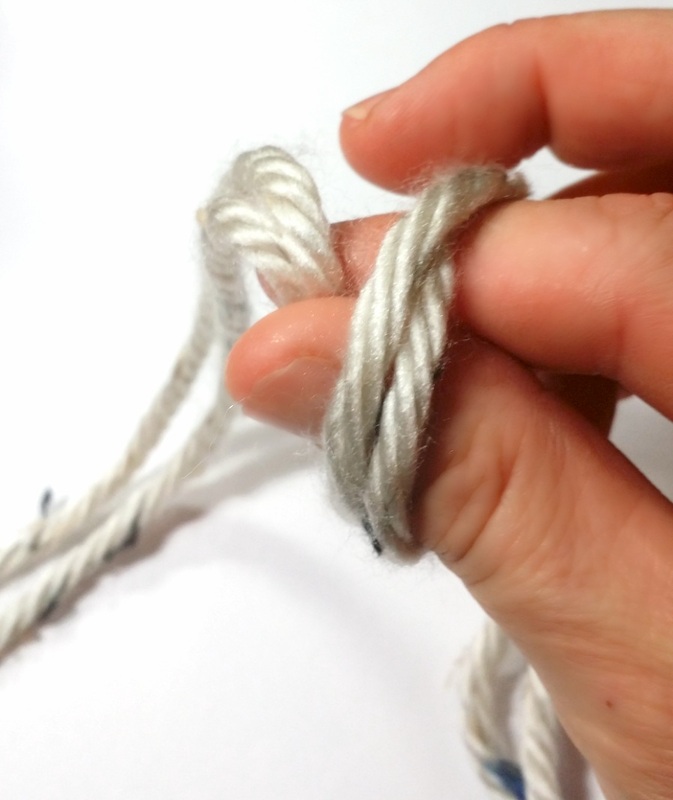 Uno: Make a slip knot just like you do when you start any crochet, and using your beautiful human asset of opposable fingers, stick your pointer finger and thumb right through that slip knot, and pinch the WORKING yarn (the yarn that is coming off the ball). Dos: Pull that yarn you’ve grasped right on through the loop, same way you would if you were using a hook, just with your fingers instead. Tres: Take a moment and measure. For this project, we want to attain a loop that is about 2″ long (unstretched) from where it comes out of the previous chain to the top of the loop. You certainly will not be measuring every loop, I just want you to have a good visual of how big you want to make these loops. Keep practicing until you can get a nice consistent even tension. There, now go open the skills toolbox, and throw this new skill right on in there. That’s all there is to it. You’ve earned your Crochet Scout Merit Badge for the day. NO hook 🙂 But you’ll need a way to make pom poms, I’ve used the extra large Clover pom pom maker for a 4.5″ pom pom. You can however, create yours using any method you like! You can substitue any super bulky size 6 yarn held double strand or worsted weight yarn held quadruple strand with similar results. Size: To fit the average adult. Gauge: While gauge is not of critical importance, try to keep an even tension and loop height of 2″ throughout to achieve proper drape. We will be measuring the strands as opposed to counting the chains for this. Using the finger crochet method shown above and keeping an approximate 2″ loop size, finger crochet (7) strands that are 6 ft long, NO counting chains, just length. When you measure, be sure not to stretch the strand, just lay it flat and measure. 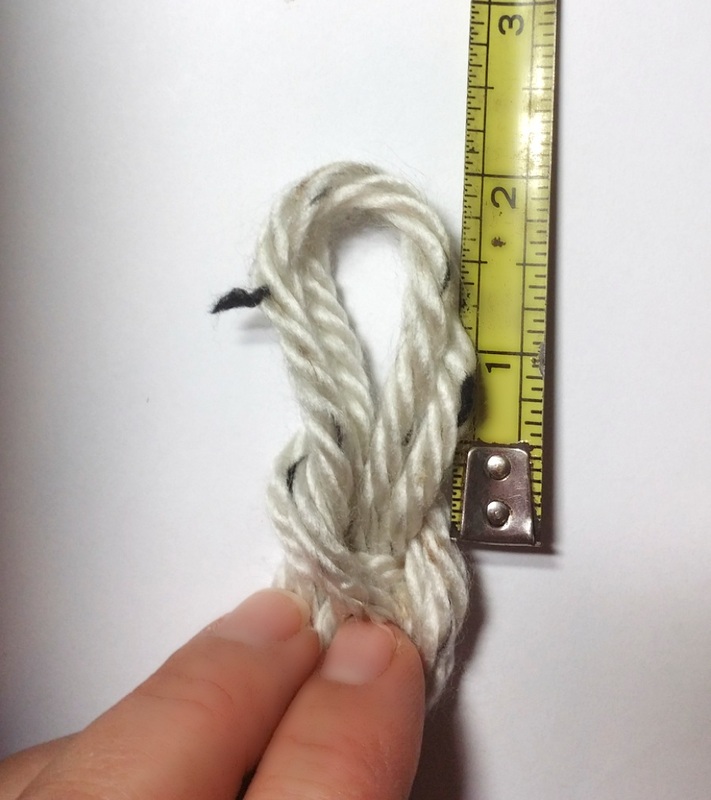 Keep your beginning and end tails about 8″ long each so they can be knotted together easily. 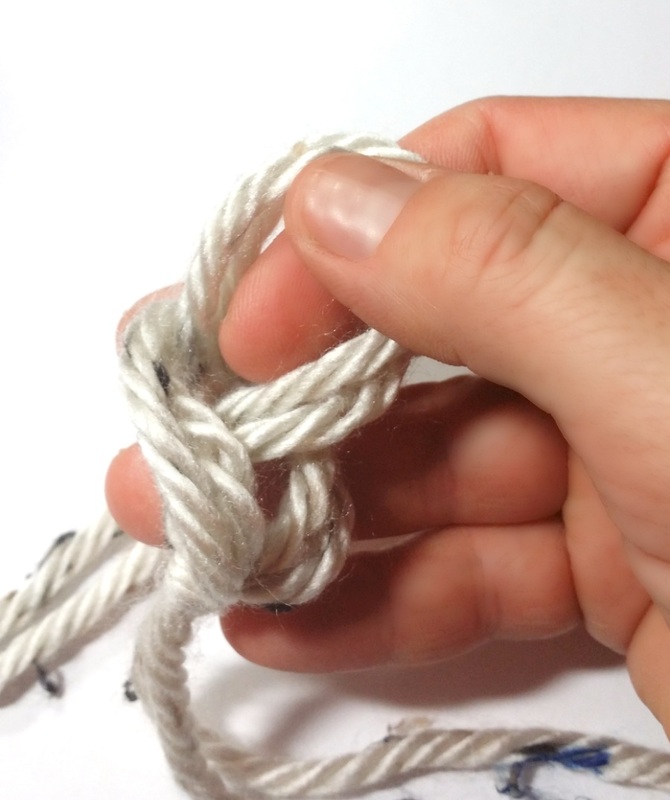 Using a standard overhand knot, line all the strands up evenly, and holding all the tails as one, knot them together. Repeat for the other end. You’ve got a pretty bulky knot there, but don’t fret, the huge pom pom will fit right over that and it will blend nicely and become part of the design. Now, take all those tails and weave them back up into the strands on both ends of the scarf. You will be left now with a long scarf and two nubby knotted ends. Create the MONSTER pom poms. Even though I’ve made the pom pom using the Bernat baby blanket, I like to gather and knot it together using a double strand of basic red heart worsted yarn in a similar color. Why? Because that stuff is tough as nails and you can really pull tightly and make a secure pom pom. Using the tails from the pom pom securing, snuggle the nubby knot of the end of the scarf inside the pom pom so it’s cohesive, and weave those tails up into the scarf. Repeat for the other side. You are DONE! Using the finger crochet method shown above and keeping an approximate 2″ loop size, finger crochet (3) strands in each color that are 6 ft long, NO counting chains, just length. When you measure, be sure not to stretch the strand, just lay it flat and measure. Keep your beginning and end tails about 8″ long each so they can be knotted together easily. You will have NINE strands total, 3 of each color. Now, using a standard overhand knot, line up 3 of the strands, one of each color, and holding all the tails as one, knot these three together on one end only. I stuck the knot inside a drawer and closed it so it would be held firmly to proceed, you could also have someone hold it for you. BUT, you will braid these three strand together in a standard 3 strand braid, doesn’t matter if it twists, this adds to it. Just be sure you don’t pull and stretch the strands when you braid. Just braid nice and gently. Once you reach the other end, braid just a few times into the tails so the ends of the chains snuggle together nicely, then overhand knot the tails together to secure just like you did in the beginning. Repeat step 2 twice more. You will know have 3 strands all braided. Instead of over hand knotting all these together, I’ve used a needle and yarn to secure them, the knot just got too bulky otherwise. Just weave in and out of all three braided strands near the knots to secure them together. Repeat the same thing for the other side. Then, weave all those tails BACK up into the braid, keeping the same color tail woven into the same color strand as you work. We have a long scarf now with two nubby ends. 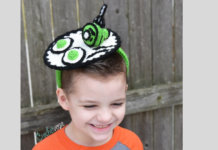 Create the MONSTER pom poms. Even though I’ve made the pom pom using the super bulky yarn, as stated above, I like to gather and knot it together using a double strand of basic red heart worsted yarn in a similar color. Why? Because that stuff is tough as nails and you can really pull tightly and make a secure pom pom. Using the tails from the pom pom securing, snuggle the nubby knot of the end of the scarf inside the pom pom so it’s cohesive, and weave those tails up into the scarf. Repeat for the other side. Second style complete! I expect to see you in 30 minutes over at the FACEBOOK PAGE HERE! all bragging and what not, showing off your new skill! Previous articleTree Stand Utility Apron – Keep out the cold with function! I am so trying this tonight! I’ve been looking for a cowl for a gift exchange and this works great! It’s perfect for that! 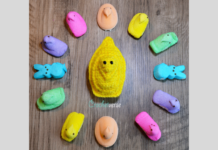 When you’re done, please post it on the Facebook page “Crochetverse” so I can see! Great idea and great tutorial! Lovely! What about a pattern for the scarf shown in the beginning with the button? Not the same as the patterns shown. The pattern was originially a different one showing that button. Due to personal error, I chose to not offer that pattern and instead replace it with what you see here on the posting. The image had been screenshot by others at that time so from time you time you will still see the pattern that is no longer available. Sorry for the confusion but the screenshot took those shares out of my hands.